*Treatments only available on selected days. Fraxface works with Radiofrequency (RF) and the RF is delivered into the skin via little pins. It delivers heat to the first and second layer of the skin. Heat is very important to create a stimulation in a specific cell called the fibroblast- this little fibroblast cell is found in the dermis and is responsible for collagen and elastin production. The tip we place on the surface emits RF to the underlying skin and creates a micro trauma in the skin- this will then activate the fibroblast cell to stimulate and therefore MORE collagen and elastin starts to form. BUT at the same time we have ablation taking place as well on the very first layers of our skin, so the pins will be embedded into the skin creating cell regeneration and as soon as new cells are formed there is a new skin layer produced. This is what we want in order to create skin rejuvenation and treat deep conditions. This is done in a very controlled manner and in a way that has been medically proven to give you the best results. Intense heat may be experience 10 – 15 minutes after treatment as well as extreme redness. No swimming in a chlorinated pool. Tiny scabs of less than 1 mm diameter will usually form 24-72 hours post treatment and may remain for several days. (3 to 7) The scabs should not be touched or scratched even if they itch, and should be allowed to shed off naturally. Blistered or ulcerated skin can be treated with a prescribed antibiotic ointment or burn treatment cream as per physician's discretion. During the first two days following treatment, care should be taken to prevent trauma to the treated site: avoid hot baths, massage, etc. The skin should be kept clean to avoid contamination or infection; any mechanical or thermal damage to the area must be avoided. Moisturiser (approved by your therapist) may be applied several hours after each treatment and then should be applied regularly throughout the course of the treatment. Make-up may be applied only 24 hours after each treatment. No pre-approved lotions or creams may be applied within a 12 hours’ period after the treatment. After Twelve hours after treatment patients may use regular cleansers, but not scrubs or exfoliants. The patient should use a high-factor sunscreen (SkinProtect 30 SPF) and protect the treated area from sunlight for at least one month after the treatment. Tanning of any sort (sun exposure, tanning beds, and artificial sunless tanning lotions) is not allowed in the treated areas during the entire course of the treatment. Tanning after treatment may cause hyper-pigmentation. Apply only pre-approved soothing creams i.e. Vitatherapy Serum, Tissue Repair serum are your best choice to apply on the day of the treatment as well as thereafter. Do not apply any retinol based creams for 7 days before and after the treatment. Dermal Fillers – please wait 20 – 30 days after this treatment. IPL (intense pulse light; skin rejuvenation and hair removal) – please have a 15 day waiting period before AND after the treatment. Mesotherapy/Microneedling/Dermapen – please wait 10 days before or after doing this procedure. The specific interval time depends on individuals and the treatment times can be appropriately prolonged or shortened according to skin improvement. Enhanced results can be achieved in combination with other treatments including Cell Advance Chemical Peel, Collagen Induction Treatment with Dermapen end so forth, depending on your main concern. 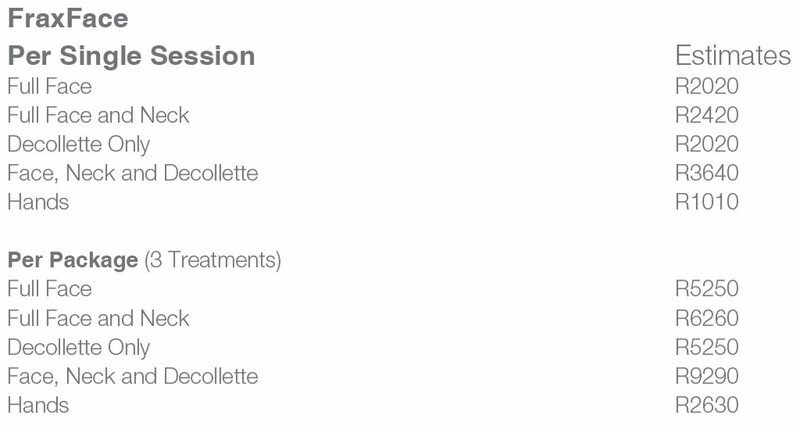 If you have any more questions in regard to Aesthetic FraxFace Treatment please do not hesitate to book a free consultation with our FraxFace expert. All booked treatments booked will include a thorough consultation.